Treats hypercholesterolemia in patients with cardiovascular disease. Reduces the atherosclerotic events in patients with history of peripheral arterial disease. Effective for hyperlipidemic patients having high risk of the atherosclerosis. Shows synergistic action in the prevention of atherothrombosis. Reduces the risk of heart attack in patients with coronary artery disease having high cholestrol levels. Exhibits stronger antithrombotic protection in coronary, cerebral or peripheral arterial diseases. 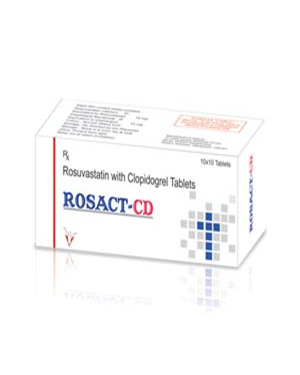 Combination of Rosuvastatin and clopidogrel is more effective to control heart disease as compare to Rosuvastatin alone.